Mortal Kombat XL includes the full Mortal Kombat X game and a variety of downloadable content (DLC). The previously released DLC packs add numerous character skins and the playable characters Tremor, Tanya, Goro, Jason Voorhees, and Predator. New to the Mortal Kombat XL release are the characters Tri-borg, Bo'Rai Cho, Leatherface, and a Xenomorph from the Alien film franchise, as well as the Pit Stage environment and even more character skins. 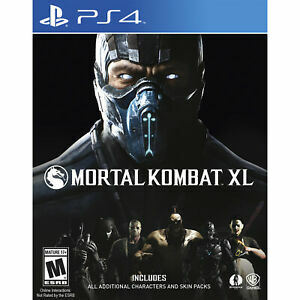 Mortal Kombat X's story mode begins at the conclusion of the previous Mortal Kombat title and extends 25 years into the future, letting gamers control a variety of new fighters, as well as aging veterans and their progeny. Each of the character variations offers new special moves and Fatalities, and the game resurrects the sprint gauge as well as Brutality finishing moves. Developer NetherRealm Studios have also imported some features from their popular superhero fighting title Injustice: Gods Among Us, including battles that take place on a two-dimensional plane but feature 3D backgrounds and contain a variety of interactive objects. Multiplayer fans can try a variety of modes, including the new Faction Wars. Faction Wars is a persistent online mode in which gamers choose to join one of five factions and then engage in online or offline (while connected online) battles to earn points for their team. The factions then compete against one another, with members of the week's victorious faction earning special rewards. The new Living Towers mode presents players with an evolving challenge, serving up different game conditions every hour. 5 star seller! Highly recommended! Great seller. Works great!! As described. Best game to play when you want to make your friends look foolish that date battling you. Awesome game full of laughs and brutal deaths MKX is the best fighting game to date. Good job Netherrealm. Great game & love the new characters. Game play is the Standar Kombat we all have grown to love & lots of extras & downloadable content; good value, but just wish it was 4 player tag team like the last one. Awesome story line,including classic movie players!The bonus download did work also.All around this is a exciting game for teenagers and adults.